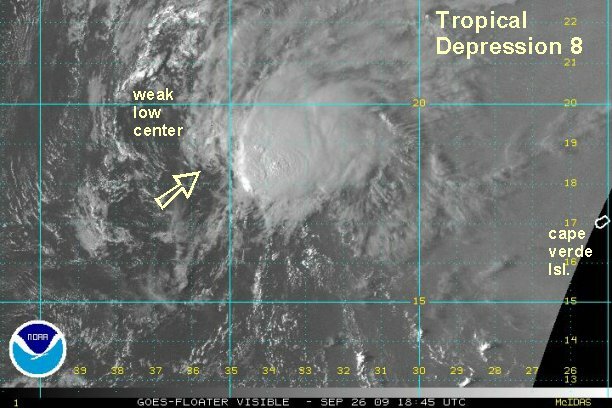 Unofficial tropical depression west of Cape Verde Isl. Satellite imagery and microwave satellite confirm that the tropical disturbance west of the Cape Verde Islands has enough structure to be classified as a tropical depression. Quickscat shows a weak although closed off surface circulation with up to 30 mph sustained winds. The structure looks rather impressive with nice banding features showing up on the north side of the circulation. The one drawback is that it is difficult to tell if the surface circulation is under the mid level. At this time is appears that the surface low is east of the mid level low which is closer to the convection. Conditions appear favorable for further strengthening. If the banding continues to improve this feature may become tropical storm Grace with the next 12 hours. At 2 pm edt / ast the tropical disturbance or unofficial tropical depression was centered 400 miles west southwest of the northwestern Cape Verde Islands. Top sustained winds are estimated at 30 mph. The tropical disturbance is moving west northwest at about 10-15 mph. Forecast models are moving this system generally northwest into the open Atlantic the next several days. These are preliminary forecasts. I just updated the previous post to include the official hurricane center info. Tropical depression 8 officially classified at 5 pm edt. After a fairly impressive burst of convection, cloud tops have warmed considerably. Over the past hour or two a new burst is just beginning on the north side of the circulation. Overall the circulation remains a little below tropical storm strength. At 11 pm edt / ast tropical depression 8 was centered near 17.4° N / 32.3° W or about 470 miles west of the northwestern Cape Verde Islands. (Note our position is different from the hurricane center's because we are estimating from a different location). Top sustained winds are estimated at 35 mph (NHC 35 mph last advisory). Tropical depression 8 is moving northwest at about 15 mph. Forecast models are moving this system generally northwest into the open Atlantic over the next several days. Even though convection has increased somewhat overnight, the overall status has not. Recent microwave estimate have placed winds at 34-47 knots. We just can't agree with that. The low level structure is still suffering. Quickscat has placed the surface low far to the south on an earlier pass....near 15.5 N. It also showed a barely closed off surface circulation. The first visible satellite imagery doesn't support the low that far south now, but we are going to estimate the surface low farther south than NHC. It looks like the surface and mid level circulation are not lined up and that the hurricane center's estimate is closer to the mid level low. This makes sense since there is southwesterly shear which would push the mid level low farther northeast. ok, enough technical stuff. 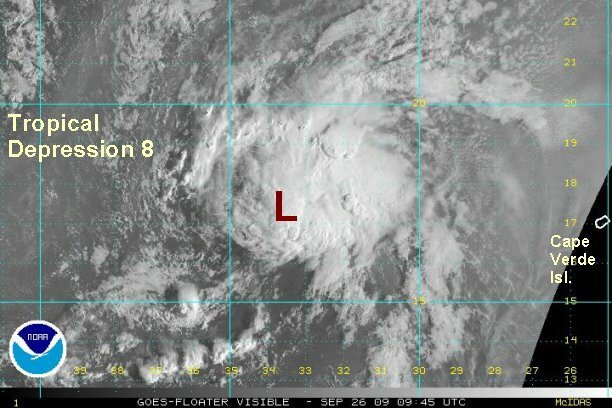 Tropical depression 8 is still not well formed but may become a tropical storm if the shear weakens. 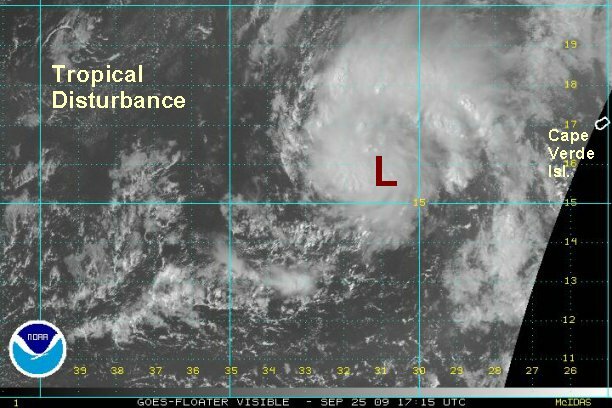 At 7 am edt / ast tropical depression 8 was centered near 17.0° N / 33.8° W or about 560 miles west of the northwestern Cape Verde Islands. (Note our position is different from the hurricane center's because we are estimating from a different location as well as different estimate point this time). Top sustained winds are estimated at 35 mph (NHC 35 mph last advisory). 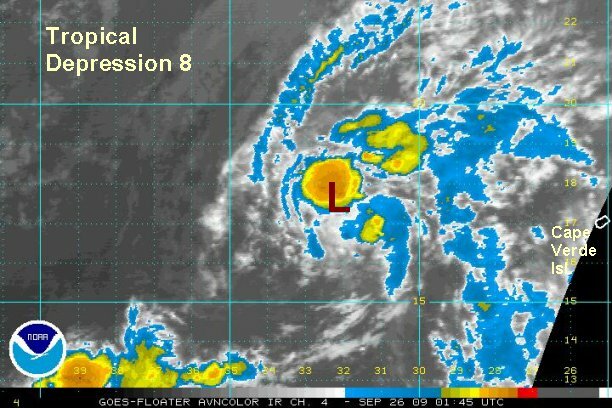 Tropical depression 8 is moving west northwest at about 15 mph. Visible satellite imagery confirms that the weak low level circulation has now been totally exposed west of the convection. We are in agreement with the hurricane center that this system has degenerated into a wave, even though deep convection remains to the east. Top sustained winds are estimated at 30 mph (NHC 30 mph last advisory). This will be our last advisory unless regeneration occurs (not likely).